The biggest of all the Dodecanese Islands by far, Rhodes (Rodos) is especially touristy and with more than 300 days of Greek sunshine every single year, its dreamy beaches soon fill up in the summer months. Rhodes is very much a holiday island, offering everything that you could possible need for the perfect Greek holiday, including a rather beautiful coastline, plenty of culture, and a very lively nightlife. Rhodes exists entirely independently from mainland Greece and its green interior is especially lush, contrasting greatly with the surrounding Aegean Sea and beachfronts. Tourists usually find the capital of Rhodes Town is usually quite captivating, particularly within its Old Town area, where enormous medieval fortifications and winding alleys offer great character. The capital is also central to the island's tourism industry, with the EOT (Tourist Information Center) being located on the corner of Papagou and Makariou, close to Mandraki Harbour, and supplies a handy English-language newspaper, the 'Rodos News'. For many, it is the endless beaches of Rhodes that make this the ideal holiday destination. In general, the best beaches tend to lie on the eastern coast and in particular, Lindos stands out as offering one of the best stretches of sand and pebbles, close to the Megali Paralia. Even in the high season, the peak time for package holidays, it is quite possible to find uncrowded beaches, which tend to be those less accessible and situated away front the road, often being a little isolated and very secluded. The beaches of western Rhodes tend to be a little more exposed, consisting mainly of small stones and pebbles, with the main tourist resorts being Ixia, Kremasti, Paradisi and Trianda. 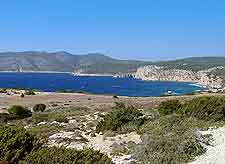 Southern Rhodes is much less developed, although both Lardos Beach and Glystra Beach should not be overlooked. More information about Rhodes Beaches. Very much and island catering to the whims of summer holiday makers, the tourist attractions of Rhodes are plentiful and much more than just beaches. Countless families choose to spend an afternoon at the Aquarium in Rhodes Town, or enjoying a glass-bottom boat trip around the shore. Other prefer to base themselves within some of the island leading resorts, such as Pefkos, Lardos and Lindos, the latter of which is home to an impressive Acropolis, as well as a number of top nightspots and eateries. 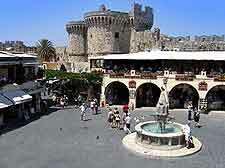 More information about Rhodes Tourist Attractions. Many of the oldest and most impressive medieval sights on the island are to be found in the historical Old Town area of Rhodes Town, and in particular, within is Knights' Quarter (Kollakio). The town's landmarks provide information about much of the island's history and Minoan past, with favourites include the Palace of Villiers de l'sle Adam, the Palace of the Grand Masters and the Temple of Aphrodite. Head to the New Town to visit the Acropolis of Rhodes or the Temple of Pythian Apollo, or to castles within the villages of Kritinia and Monolithos. And don't forget to visit the ruins of Kamiros City, which dates back as far as the 7th century BC. 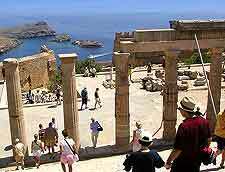 More information about Rhodes Landmarks and Monuments. The allure of Rhodes is quite undeniable and most holiday makers would be happy to spend weeks doing nothing more than soaking up the sun on the island's innumerable beaches. However, other tourists prefer to island hop, and with cruises available to so many neighbouring destinations, close to Rhodes, it is easy to see why. The main day trip destinations include the islands of both Halki and Symi, although the Turkish city of Marmaris is also surprisingly close. 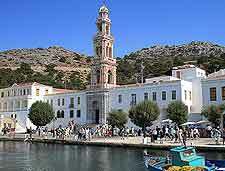 A little further afield are the islands of Crete and Kos. 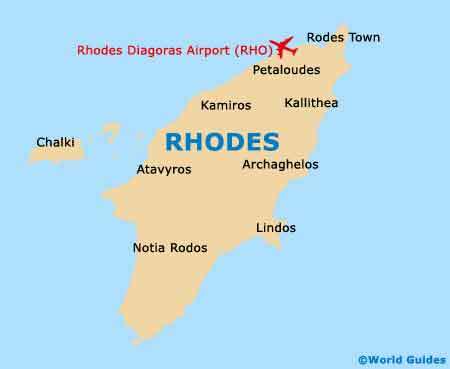 More information about Rhodes Attractions Nearby.